I was a bit reticent to believe the oiled manila paper stencil suggested via Loobylu’s blog, but it worked a charm!!!! Thanks a million for the tip on glue adhesive as well that I learned via Loobylu’s post. I think I would have been locked up in the loony bin without the aid of that tool. Got to love the goodness of blog crafting tips, tricks and suggestions! 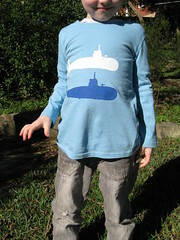 I have posted submarine photos of the friend’s t-shirts at nausea on flickr. The oiled stencil is on there too if you are wondering what the heck I am talking about.